Defiance?, the groundbreaking futuristic online open world shooter from Trion Worlds has announced its first contest merging the two worlds ofDefiance. Nolan and Irisa crossed from the game to the show, and now players have the chance to follow in their footsteps! 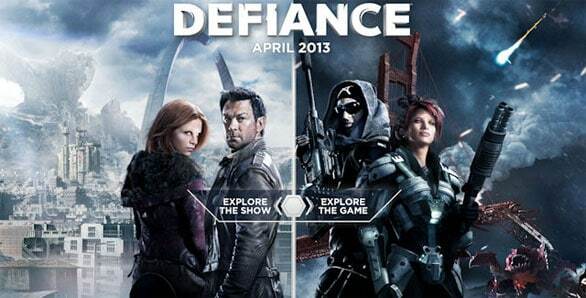 To win, fans must outgun the competition in game from April 30 – May 12 to see themselves on an upcoming episode of Defiance on the Syfy channel. Here?s how the contest works: the ark hunter earning the most ark salvage per hour (excluding ark salvage earned from the Salvage Matrix) during their time played over the course of the contest will win. Only players who register for the contest and complete both ?Most Wanted? pursuits will be eligible to win. All registrants must complete both the ?Most Wanted: Competitor? and ?Most Wanted: Rogue?s Gallery? in-game pursuits between 12:00am PDT April 30 and 11:59pm PDT May 12. Both pursuits will be in-game in the ?Goals? section of the GO menu starting at 12:00am PDT April 30. The ?Rogue?s Gallery? pursuit tasks you with eliminating various mutants, raiders, 99ers, and more, while the ?Competitor? pursuit pits you against other ark hunters in team-based PvP and Shadow War modes. The winner will have artists from the Defiance series render their character?s likeness into a special place in an upcoming episode. Defiance players have already played alongside lead show characters Nolan & Irisa, experienced the Armistice Festival and now can earn their way on the show through Most Wanted. This is just the beginning of the transmedia events coming as the game will continually introduce new missions, pursuits and storylines that connect the two media worlds. For the most comprehensive information on the all of the upcoming crossover events and new game content coming to Defiance, be sure to subscribe to the Defiance newsletter. You can subscribe by logging in to your Trion account and checking the Defiance box in the ?Newsletters? tab. Defiance delivers massive co-op boss battles and fierce multiplayer action in an evolving sci-fi universe. The game is available now on the PlayStation?3 computer entertainment system, the Xbox 360? video game and entertainment system from Microsoft, and Windows PC.